In this video, Sen. Arlen Specter (R-PA) criticizes activists that stood up in protest at a hearing on the treatment of detainees at Guantanamo Bay prison. The Senate Judiciary Committee is considering whether detainees will have only limited access to habeas corpus review. At the end of the video, Specter stands up, bangs his gavel, and walks out of the hearing. Anti-war activist Cindy Sheehan can also be seen in attendance at the hearing. Iraq saying U.S. troops were sent to fight without the best equipment and that critical facts were hidden from the public. “I believe that Secretary Rumsfeld and others in the administration did not tell the American people the truth for fear of losing support for the war in Iraq,” retired Maj. Gen. John R. S. Batiste said in remarks prepared for a hearing by the Senate Democratic Policy Committee. “Mr. 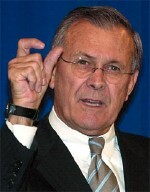 Rumsfeld and his immediate team must be replaced or we will see two more years of extraordinarily bad decision-making,” said his testimony prepared for the hearing, to be held six weeks before the Nov. 7 midterm elections in which the war is a central issue. WASHINGTON –The White House on Sunday sharply disagreed with a new U.S. intelligence assessment that the war in Iraq is encouraging global terrorism, as Bush administration officials stressed that anti-American fervor in the Muslim world began long before the Sept. 11 attacks. Peter Watkins, a White House spokesman, declined to talk specifically about the National Intelligence Estimate, a classified analysis that represents a consensus perspective of all 16 U.S. intelligence agencies. The highly classified report, delivered to policymakers in April, is the first of its kind since the start of the Iraq war in March 2003. In it, the agencies concluded that the war has only worsened the U.S. effort to defeat global terrorism. They said that the war is spreading radicalism from Iraq throughout the Middle East and that the longer it continues, the more likely it is that it will provide fresh training grounds for future terrorist plots. But the White House view, according to Watkins, is that much of the radical fundamentalists’ deep anger at the U.S. and Israel goes back generations and cannot be linked to the U.S. invasion and occupation of Iraq.